Fresh vs. Frozen Vegetables: Which are better? 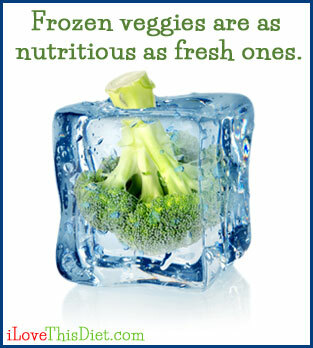 One of the biggest concerns when it comes to frozen vegetables is the nutritional content. Sure, we love the convenience of pre-washed, pre-cut vegetables but are we still getting the same nutrient-rich food if it was previously frozen? According to registered dietitian Andrea Morganstein, you’re better off buying your veggies frozen. “Don’t feel guilty that you are not buying fresh as frozen fruits and vegetables are picked and frozen at their nutritional peak. By the time fresh produce actually gets to your table, nutrients are lost due to the transit time.” This means the longer that celery has been sitting on the shelf, exposed to light and air, the less nutritious it is. Frozen food companies flash freeze to preserve quality and flavor. And it seems freezing can preserve their nutrients too. After picking the veggies at the peak of their ripeness, flash freezing locks the food in a nutrient-rich state. Fresh produce is usually picked before it is ripe and then shipped to the supermarkets. And, unfortunately, this prevents the veggies from fully developing their nutrient content. Also, if the produce isn’t in season, there’s a high chance transporting it took longer than usual. Long shipping times expose produce to mold and fungi as well as degrade the nutrients and minerals. Their final recommendation? Just don’t store frozen produce for longer than 6 months as nutrients begin to break down significantly around this time. So when your produce travels from the farm to your fork, it’s okay if it hits the freezer in between. To avoid food from spoiling early, the FDA has approved irradiation on meat, poultry, fruits, and vegetables. Irradiation is a process by which food is exposed to radiant energy such as x-rays, electron beams, and gamma rays to kill bacteria, prevent ripening, and to prevent spoilage. Many foods bought at your supermarket have been irradiated. The controversial aspect of irradiation was acknowledged by the FDA but in 1963 they deemed irradiation of food to be safe. The FDA has approved Irradiated foods are supposed to be labeled as “treated with radiation” or “treated by irradiation,” however this regulation isn’t consistent for every food. Thinking about canned food as an alternative to fresh or frozen? Watch out, as canned can be some of the worst food you can buy. Not only are salt and preservatives usually added, but harmful chemicals leach from the can into the food. Moreover, the canning process, which uses high temperatures, denatures the food. Buy what’s in season when it’s fresh and ripe. Anything not in season, go for your trusted freezer aisle.